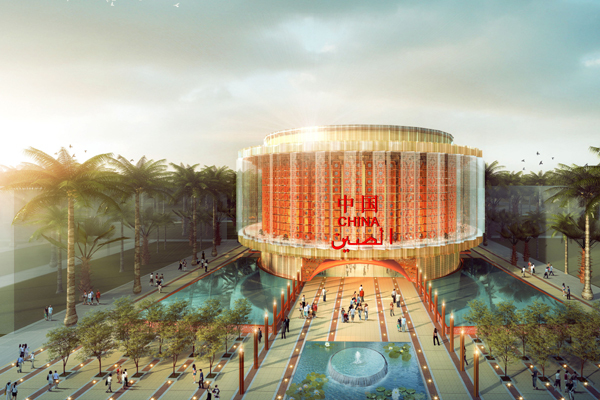 China has unveiled the design for its country pavilion at the upcoming Dubai Expo 2020 gala which is heavily inspired by the Chinese lantern. Through its theme of “Building a Community with a Shared Future for Mankind - Innovation and Opportunity”, the China Pavilion will be one of the largest at Expo 2020 Dubai at 4,636 sq m.
The China Pavilion will symbolise hope and a bright future and is designed in line with the principle of “combination of the Chinese and Western culture with Chinese culture as the core”. It will vividly showcase China’s profound culture and longstanding history by artistically integrating the Chinese elements with modern technologies. The innovative design was unveiled today (April 10) in the presence of Ambassador Ni Jian, Embassy of the People’s Republic of China in the UAE, Najeeb Mohammed Al Ali, Executive Director, Dubai Expo 2020 Bureau and Zhang Yi, Deputy Secretary General of China Chamber of International Commerce. Among other attendees were more than 150 guests including representatives from Expo 2020 Dubai, Dubai Tourism, the Consulate General of the People’s Republic of China in Dubai, China Council for the Promotion of International Trade (CCPIT), UAE and Chinese entrepreneurs, media, and China Pavilion partners. Ruan Wei, Director of Expo Affairs, CCPIT, gave an update on China’s participation progress and presented the design of the China Pavilion. Zhang Shenfeng, Vice Chairman of the CCPIT, has been appointed as Commissioner General of the China Pavilion at Expo Dubai 2020. Symbolizing brightness, reunion, auspiciousness and happiness, the Chinese lantern is the best way to display the joint efforts made by all countries and regions to seek sustainable development and build a community with a shared future for mankind via the world expo, said top officials at the launch. Reflecting China’s endeavors in practicing the “Belt and Road” Initiative, the pavilion will mainly showcase the achievements made by China in science and information communication. It will also further advocate jointly practicing the “Belt and Road” Initiative and accelerating to build a community with a shared future for mankind from four aspects of “exploration & discovery”, “communication and connection”, “innovation & cooperation” and “opportunity and future” through a main focus that innovation gives rise to opportunity, opportunity creates the future and future enables common development. According to senior officials, there will be three main unique features of the China Pavilion at Expo 2020. First, innovation in the theme. The China Pavilion concentrates its focus on “innovation” to promote China’s development proposition of adhering to drive the institutional and scientific innovation, accelerating common development, practicing the 2030 Agenda for Sustainable Development and building a community with a shared future for mankind. Second, innovation in architecture design. During the design and construction of the China Pavilion, traditional Chinese elements, modern architecture concepts and techniques will be artistically combined to present China’s spirits to the world, culture and its unique features. Eco-friendly architectural materials are applied for the outside surface of the China Pavilion through modern techniques, vividly manifesting the profound Chinese culture. Thanks to innovative multi-media technologies, light shows at night make the China Pavilion even more dazzling in the park. Finally, innovation in exhibition. The China Pavilion will showcase the innovative scientific results made by the country in such fields as information, science and transportation through unique and hi-tech exhibition means. Then, FSAT, Beidou, 5G, AI and other state-of-the-art technologies will be exhibited in the core place of the China Pavilion together with CRH simulated driving and intelligent connected vehicles to highlight China’s “smart travel”.